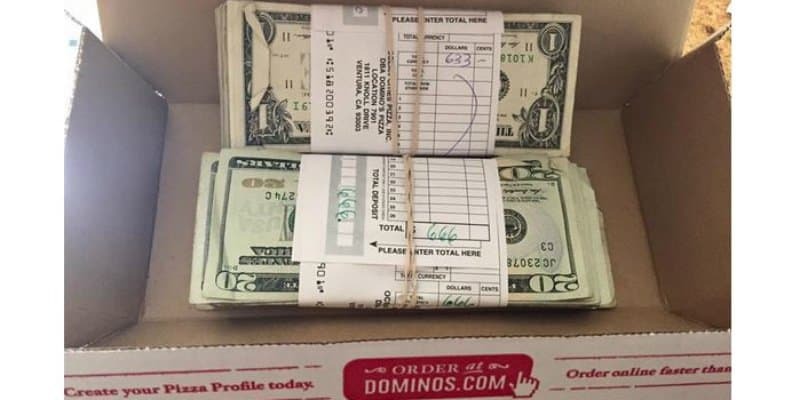 A San Francisco bartender got a nice surprise when he ordered some pizza and chicken wings Friday night from Domino’s. The box was delivered, but then the man, Mike Vegas, got called in to work at his job at AT&T Park. He put the box in his fridge to eat later. When he got home later, hungry and ready to eat, he opened the box. Instead of pizza or wings, he found two stacks of cash totaling $1,300. Mike is an honest guy, so he called Domino’s. The staff had put the money in a pizza box to take it to the bank for deposit, but someone mixed it up with Vegas’ chicken wings order. The restaurant had tried to call Vegas when they found their mistake, but he was at work and ignored the calls. Domino’s was so happy to get the money back that they’re supplying Mr. Vegas with free pizza for a year.